More often than not we eat things that we should eat or we eat more junk than we should. As a result, we often have digestive problems. 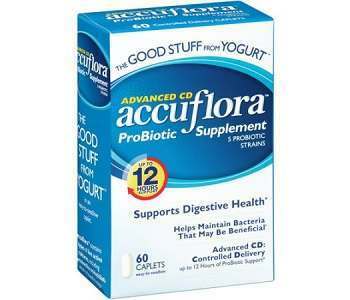 This review will take a look at a probiotic supplement called Accuflora. 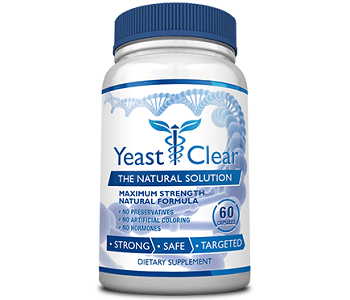 This product claims to support digestive health and regulate your body’s internal balance. The manufacturer also states that Accuflora can replenish healthy bacteria in the digestive tract and assist with regularity. This product is made in the United States and is available online from third party retailers. It is free of wheat, soy, gluten, eggs and nuts. This product contains a probiotic blend of Lactobacillus acidophilus, Lactobacillus rhamnosus, Bifidobacterium bifidum, Lactobacillus salivarius, Streptococcus thermophilus. Other ingredients include microcrystalline cellulose, hydroxypropyl methylcellulose, pectin, guar gum, silica dioxide, stearic acid, and turmeric. This product contains milk. The recommended dosage is to take two caplets up to 2 times per day. You can take Accuflora caplets with or without food and with water, fruit juice or milk. There is not a specific time of day to take Accuflora. The manufacturer states that Accuflora is tested by both in-house and through certified contract laboratories. As a result, it is deemed safe. There is no mention on its website if there are side effects. However, it contains milk, which may cause allergies to some consumers. Additionally, some consumers reported that they experienced adverse reactions such as bloating, diarrhea, digestive cramps, constipation, and nausea. In any case, we recommend, that you should consult your doctor before taking this or any other supplement. This is sold only by third party retailers and not via the manufacturer. One bottle of this product contains 60 caplets and costs $9.88 (not including shipping). There were some discounts available if you buy more than one product at a time. For example, if you buy a pack of two you pay $24.95. The manufacturer does not provide any type of money back guarantee for Accuflora. If you purchase this product from third party retailers, they may provide a money back guarantee, which will vary according to the site. On the manufacturer websites, we found only positive reviews, which is to be expected. We found some mixed reviews on other sites. Some consumers liked that it was fast acting but the majority complained that it caused side effects and that it did not work at all. Accuflora contains a probiotic blend that has been tested for microbes, potency, and heavy metals by both in-house and through certified contract laboratories. It is free of wheat, soy, gluten, eggs and nuts. However, it contains milk, which may cause allergies to some consumers. This product does not come with a money back guarantee, which is unfortunate since consumers cannot attest to its reliability. We were concerned that we found mixed reviews on retailer sites that stated that this product is not as effective as it claims to be and about the many side effects that some customers have reported experiencing. Buyer beware.